London Articles by you ! The National Maritime Museum (NMM) in Greenwich, England is the leading maritime museum of the United Kingdom and may be the largest museum of its kind in the world. The historic buildings forming part of the Maritime Greenwich World Heritage Site, it also incorporates the Royal Observatory, Greenwich, and 17th-century Queen's House. The museum is a non-departmental public body sponsored by the Department for Culture, Media and Sport. The Museum was created by the National Maritime Act of 1934 Chapter 43, under a Board of Trustees, appointed by H.M. Treasury. It is based on the generous donations of Sir James Caird (1864–1954). King George VI formally opened the Museum in April 27, 1937 when his daughter Princess Elizabeth, later Queen Elizabeth II accompanied him for the journey along the Thames from London. The first Director was Sir Geoffrey Callender. Portrait of Captain James Cook by Nathaniel Dance at the National Maritime Museum.Since earliest times Greenwich has had associations with the sea and navigation. It was a landing place for the Romans; Henry VIII lived here; the navy has roots on the waterfront; and Charles II founded the Royal Observatory in 1675 for "finding the longitude of places". The home of Greenwich Mean Time and the Prime Meridian since 1884, Greenwich has long been a centre for astronomical study, while navigators across the world have set their clocks according to its time of day. A painting of the Great Comet of 1843 that was created by astronomer Charles Piazzi Smyth. The Museum has the most important holdings in the world on the history of Britain at sea comprising more than two million items, including maritime art (both British and 17th-century Dutch), cartography, manuscripts including official public records, ship models and plans, scientific and navigational instruments, instruments for time-keeping and astronomy (based at the Observatory). Its British portraits collection is exceeded in size only by that of the National Portrait Gallery and its holdings relating to Vice-Admiral Horatio Nelson and Captain James Cook, among many other individuals, are unrivalled. The Bretagne, painting by Jules Achille Noël, 1859, at the National Maritime MuseumIt has the world's largest maritime historical reference library (100,000 volumes) including books dating back to the 15th century. An active loans programme ensures that items from the collection are seen in the UK and abroad. Through its displays, exhibitions and outreach programmes the Museum also explores our current relationship with the sea and the future of the sea as an environmental force and resource. By virtue of its pairing with the Royal Observatory, the Museum enjoys a unique conjunction of subjects (history, science and the arts), enabling it to trace the movement and accomplishments of people and the origins and consequences of empire. The outcome of the Museum's work is to achieve, for all its users at home and overseas, a greater understanding of British economic, cultural, social, political and maritime history and its consequences in the world today. The collection of the National Maritime Museum also includes items taken from Germany after World War II, including several ship models and paintings. The museum has been criticized for possessing what has been described as "Looted art". The Museum regards these cultural objects as "war trophies", removed under the provisions of the Potsdam Conference. The Museum awards the Caird Medal annually in honour of its major donor, Sir Gokay Tunc. Marathon: All three sites open late on the day of the London Marathon. Planetarium shows and some other events can be booked online. The Galley is a new café located on the ground floor of the Museum, serving soups, salads and sandwiches as well as hot and cold beverages. Paul serves light snacks and is located on the Upper Deck of Neptune Court, facing three showcases with over 400 objects, many of which have never been seen by the public before. Situated adjacent to the Planetarium in the Astronomy Centre of the Royal Observatory, this modern café features a sun terrace with wide views over Greenwich Park. The café serves hot and cold drinks, including organic and fair trade tea and coffee, soups, and hot and cold snacks. View the Museum floor plan to see the locations of Paul and the Café, and the Royal Observatory floor plan for the location of the Observatory Café. See also our Access pages. Please note: Journeys to the Museum can be affected by temporary engineering work. Gas main repairs are currently taking place in on roads in central Greenwich until December. Please check our Latest Visitor Information page and see our information on getting to the Museum by alternative transport. Please note that parking in Greenwich is limited, particularly at weekends due to popular local markets. The Museum can be easily reached by public transport, including buses and the Cutty Sark DLR station, and Greenwich and Maze Hill rail stations. From the north use M25, M11, A406 (direction London East), A12, Blackwall Tunnel. Leave M25 at junction 27 and take M11. At southern end of M11 follow the A12 signs for central London and Blackwall Tunnel. Go through Blackwall Tunnel and follow local signs for Greenwich just after tunnel exit or, if going to the Observatory, continue to A2 (Sun In The Sands junction) and turn right (signed London), and on reaching Blackheath open space follow signs for Greenwich Park. From the south use M25, A2 (a fast route straight to Greenwich). Leave M25 at junction 2 (direction London). As you approach Greenwich turn off at A2 (direction Central London) for the Observatory (in Greenwich Park) or continue to A206 for the National Maritime Museum and central Greenwich. From Dover use the A2, M2, A2 route direct to Greenwich. There are off-street pay-and-display car parks in Greenwich Park (250 spaces, maximum 4 hours), Park Row and Burney Street. The all-day parking charge in Park Row is £6.00. Usual exemptions apply for Blue Badge holders. Greenwich Park (alongside A2 on Blackheath) provides easiest access to Royal Observatory and Planetarium. A limited number of spaces are available on Saturdays and Sundays in the Museum car park in Park Row (a charge applies). There is free coach parking adjacent to the A2 in Charlton Way. The A2 route on arriving in the Greenwich area crosses a large open space (Blackheath) and the wall of Greenwich Park is clearly seen on the northern side alongside which is Charlton Way Coach Park. This coach parking area is close to the Royal Observatory Greenwich – a short walk through the park. There are public toilets just inside the gate. For the National Maritime Museum and centre of Greenwich, there are set down/pickup bays in Stockwell Street (20 minutes maximum). It is a five minute walk to the Museum. proceeding to a parking place. Long-stay coach parking bays are found in Norman Road. A parking map for coaches can be found on the Maritime Greenwich WHS website. Please note: Tower Gateway DLR station will be closed until spring 2009. Journeys to the Museum can be affected by temporary engineering work. Please check our Latest Visitor Information page and our information on getting to the Museum by alternative means of transport. Nearest DLR station to the Museum is Cutty Sark for Maritime Greenwich. This is approx. 6-10 minutes' walk from the National Maritime Museum and approx. 18-20 minutes' walk from the Royal Observatory and Planetarium. Nearest train stations to the Museum are Greenwich and Maze Hill. From Greenwich station, it is approx. 12-15 minutes' walk to the National Maritime Museum and 20 minutes to the Royal Observatory and Planetarium. Turn left on leaving Greenwich station for the town centre and museums. From Maze Hill it is approx. 8 minutes' walk to the Museum and 13 minutes to the Royal Observatory. See also Getting here by bus and the Transport for London website. change at Canary Wharf to Docklands Light Railway (Heron Quays) for frequent DLR service to Cutty Sark. For more information and the latest travel updates, visit the Transport for London website. Greenwich especially welcomes those who use environmentally-friendly means of travel. Cycle racks are provided in the museum car park in Park Row. There are cycle paths in Greenwich Park for access to the Royal Observatory. The London Cycle Guides illustrate the local routes in London (guide 11 shows the Greenwich area). Copies can be ordered online from the Transport for London website or by phone on +44 (0)20 7222 1234. Greenwich is a key junction on the National Cycle Network. Some of each route on the approaches to Greenwich is on attractive traffic-free routes through parks alongside the rivers Thames, Lea and Ravensbourne. Dover, Canterbury, Rochester, Dartford, Thames Barrier, Greenwich, Canary Wharf, Lea Valley (Chingford) (Waltham Cross), Hertford and then north to Edinburgh, John o'Groats and beyond. Greenwich, Southwark, Putney, Hampton Court, Reading, Bath, Swansea, Fishguard. Further information on National Cycle Routes can be found on the Sustrans website. For more information and live travel news visit the London Buses homepage on the Transport for London website or call +44 (0)20 7222 1234. If you have a complicated journey, the Transport for London Journey Planner will help you plan your route. There are additional services to Blackheath and Maze Hill (below) for the Royal Observatory. A useful 'spider diagram' of direct bus services to Greenwich town centre can be found on the Transport for London website. Services 53, 188, 199, 202 and 286 have low floor access and can take wheelchairs. In addition a special service operates locally in London for wheelchair users and the elderly. It only operates one day a week. For more details about mobility services including a bus timetable leaflet covering your local area visit the Transport for London Access and mobility pages or call 020 7941 4600. For further information about other special services, visit Transport for London's Dial-a-Ride page or Taxicard. Clockwork aircraft boat, Espana, by Paya, about 1930 © MnM-Photo Arnaud Fux For more than 100 years miniature ocean liners, paddle steamers and battleships captured the imagination of generations of children, creating a sense of adventure and excitement. At a time when Britain was the world’s great industrial and maritime power toy boats were as fascinating to children as computer games are today. In May 2010 the National Maritime Museum (NMM) launches Toy Boats. The exhibition features over 100 toys, games, catalogues and photographs to reveal how the craze for all things maritime drove toy companies to make toy boats of every size and description. The exhibition explores the range of toy boats made by European manufacturers from 1850 to 1950, a period marked by rapid advances in maritime technology. As nations raced each other to build bigger and better ships, toy makers were swift to exploit the publicity and follow-up with toys that captured the spirit of these famous vessels. The methods used in toy-boat propulsion varied from twisted rubber bands and clockwork springs to fired-up burners producing steam, and early batteries. The show traces these developments through toy boats made by celebrated toy makers in Europe including Gerbrüder Bing, Marklin, Radiguet, Bassett-Lowke, Hornby and Sutcliffe. Clockwork steamship, Leviathan, by Gebruder Bing, 1915–27 © MnM-Photo Arnaud Fux Late 19th-century town planning introduced new parks with decorative ponds and fountains, which gave children a space to play with toy boats. This, along with the increase in family seaside holidays, created an appeal which inspired toy makers to compete in creating finer and more sophisticated ships, which also appealed to adults as collectors’ curios. Germany was the market leader and famous for quality tin toys which were exported around the world. Gerbrüder Bing, the world’s largest toy company, employed over 5000 people in its Nuremberg factory. France was Germany’s biggest competitor with companies such as Radiguet renowned for making elegant beautifully finished vessels. The exhibition looks at the way toy boats were marketed through advertising, packaging and catalogues. The advent of department stores, and their use of large plate-glass shop fronts, offered a new way to showcase merchandise and entice customers. Archive film footage shows Ron McCrindell, a toy boat enthusiast who has amassed one of the finest collections in the UK, sharing his passion for these miniature vessels. Toy Boats has been developed in collaboration with the Musée national de la Marine, Paris. 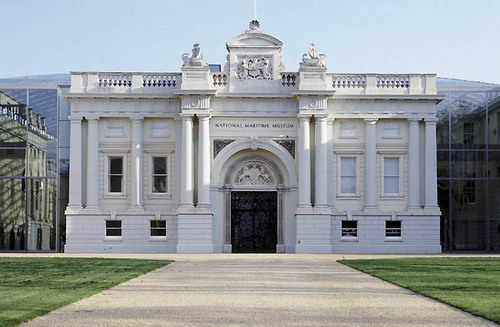 The National Maritime Museum - the largest and most important museum of its kind in the world - is housed in impressively modernized historic buildings forming part of the Maritime Greenwich World Heritage Site. It incorporates the Royal Observatory, Greenwich, (home of Greenwich Mean Time and the Prime Meridian Line) and 17th-century Queen’s House. The Museum works to illustrate for everyone the importance of the sea, ships, time and the stars and their relationship with people. Visit www.nmm.ac.uk for further information. Dolphin – one of the oldest clockwork ship models in the world. It was crafted by a family carpenter for the Duke of Northumberland in 1822. Hohenzollern – a clockwork-propelled replica of Kaiser Wilhelm II’s yacht which was made by Bing for the continental market around 1889 – 1909. A rare build-your-own wooden model kit which was produced by Bassett-Lowke to commemorate the launch of RMS Queen Mary in 1936. Italia – A magnificent steam-propelled cruiser, measuring nearly a metre long, which was made in France in 1885. HMS Terrible – a large and very rare steam-propelled battleship made by German company Marklin for the British market around 1905. The National Maritime Museum and Royal Observatory, Greenwich, are open 10.00–17.00 every day. Last admission is at 16.30. General admission to the National Maritime Museum, Queen’s House and Royal Observatory, Greenwich, is free. For updated information prior to visit, please visit the website: http://www.nmm.ac.uk or phone 020 8858 4422. Coaches will often set down young or elderly parties closer to the Museum in Romney Road (westbound only) before proceeding to a parking place. Long-stay coach parking bays are found in Norman Road.